The e-dermis could allow patients to feel pain and other sensations. Up until the 20th century, wearing a prosthetic limb wasn’t all that great. They were often unwieldy wooden contraptions with both form and function that fell far short of their natural counterparts. Today, though, we have prosthetics that we can control with our minds, that predict movement, and that fit perfectly thanks to 3D printing. Still, even the most advanced prosthetics have room for improvement. They still don’t give the wearer a ton of feedback about what they’re touching — no temperatures, no textures. That’s why researchers at Johns Hopkins University have created a new electronic dermis (e-dermis). When placed over a prosthetic device, this artificial skin lets an amputee feel pain and other sensations in their missing limb. The researchers published their study Wednesday in the journal Science Robotics. To create an electronic skin that functions like human skin, the researchers started by looking — where else? — at human skin. They noted that our skin contains a network of receptors that relay a variety of sensations to the brain, letting us know if what we’re touching is sharp or smooth, hot or cold, hard or soft, and so on. They designed their device to transmit two specific sensations: the curvature of an object and its sharpness. They constructed their e-dermis out of a combination of fabric and rubber, adding in layers of sensors to imitate the receptors in human skin. 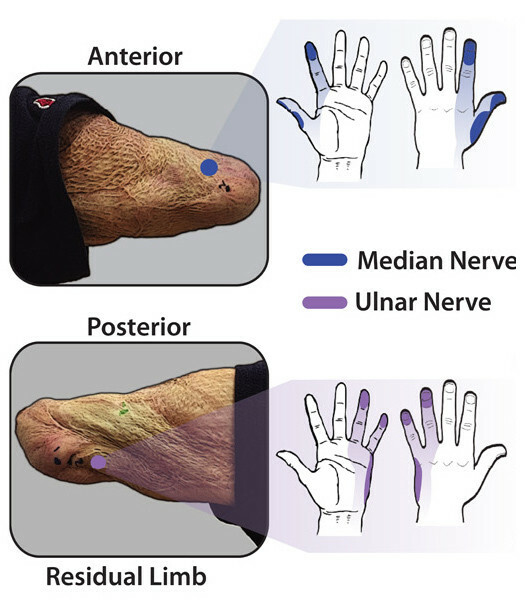 These receptors could detect the sensations of an object — whether it’s sharp, for example — and then send those sensations to the peripheral nerves in an amputee’s residual limb via wires. To figure out what kind of information the device should send its wearer, the researchers used a technique called transcutaneous electrical nerve stimulation (TENS) to stimulate the peripheral nerves in the amputee’s residual limb and ask what they felt in their phantom limb. For example, say a certain level of TENS at one location on the residual limb produced a sensation of pain in the amputee’s phantom thumb. The researchers would know to deliver that level of electronic stimulation to that location when the prosthetic’s thumb touched something comparably painful, such as a sharp object. They detected brain activity using electroencephalography (EEG) to confirm that the process stimulated the phantom limb. Essentially, the researchers taught their e-dermis to electronically encode different sensations just like human skin does. One way that could be beneficial? The e-dermis could make prosthetics feel more life-like while protecting them from damage. Eventually, the e-dermis could even help us give robots the ability to “feel” sensations in a human-like way, the researchers note in a press release. For now, though, giving humans the ability to feel those sensations once again is probably exciting enough.